How many times have you played the game, “Would You Rather?” when you were a kid? Actually, who am I kidding? As an avid Buzzfeed reader (and an adult) I play every single edition of “Would You Rather” they post. This one’s my favorite if you guys are up for it! Since these are so much fun, we made an edition just for EHR software! Just a heads up, my version doesn’t necessarily have questions that put you in a tight dilemma like how this game usually goes, but it will help get you thinking! And your answers will also help determine some important decisions when shopping for a system. Have fun! Decide your EHR Software with a Game of "Would You Rather"
A: You’re an IT expert and a client-server software is for you! You like full ownership of your software and you seek comfort in knowing that your software is on premise so you can easily access it. But did you know that it is still vulnerable to security hacks especially if you failed to meet HIPAA security standards? And you aren’t ensuring high physical security by simply keeping the server room locked. You should also be aware of your total cost of ownership. On top of paying for the hardware, you have to ensure that you have the infrastructure in place to run it. This could mean added IT expense when you are required to purchase servers and equipment that has to be compatible with your software. B: You know you have better things to do with your time and money, so you should go with a cloud-based software. Cloud-based software does not require server installation so you avoid all IT costs. You EHR vendor will help you to keep up with maintenance, backups, upgrades, and security or your software. Pick a software that is HIPAA compliant and do extensive research on your vendor. You can be rest assured that your practice is in good hands! A: You’re probably reading this from an iPad. Cloud-based software is what you want. You only need a browser to access your software. So you are free to use any device and platform that has a browser. iPads, android, PC, Mac, tablets, laptop, desktop – it’s all up to you. B: You have trust issues, but you have that one computer that hasn’t failed you. You only want to use your client-server software on that one computer. Computers that are part of the client-server setup are typically PCs. Computers that are part of the client-server setup are typically PCs. Installation of the software is done on each computer, so you can only access the program on the computer it was installed on. But as we mentioned, some client –server systems are only compatible with certain devices. So you might not even get the chance to use that one computer you love so much! A: Commitment is your game. You’re willing to stick with a client-server system till the end of time. Ok, maybe not till the end of time. But make sure you carefully read the contracts so you know what you’re getting into. Are there limitations on the number of computers, doctors, users, and locations that can utilize the license? B: You know that you have options when it comes to pricing, so you choose a cloud-based solution. 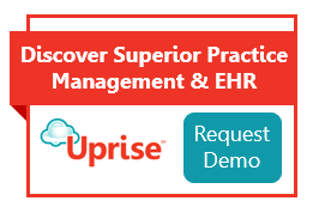 A practice management and EHR software is a huge investment for any practice. You should not have to worry about contracts or long term commitments that might come with hidden fees. But whichever system you choose to get, read the contract! There could also be varying subscription levels where you pay a premium in order to gain access to enhanced functionality. Did these questions help you evaluate your practice's needs and preference? Feel free to share your results in the comments below. If you find that a cloud-based system is for you, check out Uprise!